In the West the visual imagery of art objects has long fulfilled a representational function. However, beginning in the late nineteenth century and into the early twentieth, from the Impressionists to the Symbolists and through the fully abstract experiments of Kandinsky and others, artists began to replace depiction of recognizable objects from the natural world with works of art which themselves were meant to evoke experience. Anyone who has stepped up to the Modern Art section of the second floor of New York’s Metropolitan Museum of Art has experienced the “demand” such a work of art may make. Jackson Pollock’s 267 cm tall by x 526 cm wide Autumn Rhythm hangs on a solid white wall, confrontational not only in its size but as well in its formal daring. There is wildness and animation to the piece, created with sticks, trowels and stiffened brushes as the artist danced about the canvas on the floor. Some visitors abruptly move on. Others become entranced with the piece’s delicate mesh of complex rotations and revolutions, its rhythmic black loops and its quiet self-imposed border. With this piece Pollock moved from Jungian-inspired depiction to speaking through gesture. In so doing Pollock was not simply producing paintings, but himself experiencing painting as a “personal, salvific event.” Those close to Pollock spoke of his quest for spiritual expression.In fact, while working on Autumn Rhythm Pollock was at work on a church design project meant to incorporate his action paintings. To what end would drip paintings such as Autumn Rhythm be included in a Christian worship setting? How could such works offer Christian testimony? In many ways a church setting, more so than a museum setting, would have allowed Pollock’s action paintings their fullest imagistic impact. Within Pollock’s proposed church project his poured paintings were to have been mounted or suspended around the altar in a kind of “sacred enclosure.” Here communion would be celebrated and other matter-spirit mysteries such as the Incarnation and Resurrection preached. 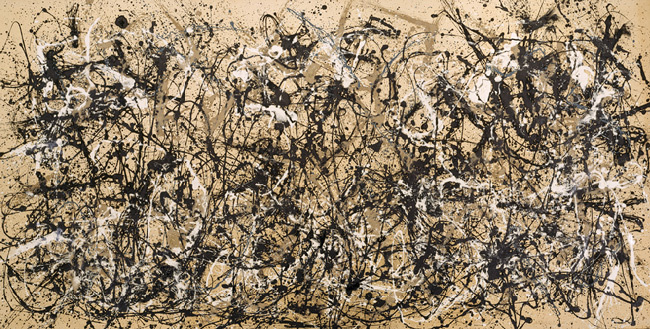 To this Pollock’s works offer a strikingly corporeal visual response. In the leaping, dipping and swinging of Pollock’s work we are provided a picture of bodily life beyond the limits of time and space. The metaphoric representation of salvific “spirit” animating “flesh” found in Autumn Rhythm suggests an aptness for celebrating the spiritually animated body for which we hope in the Resurrection. Pollock was not limited to explicit Christian references in pursuing the “body-soul” nature of existence. However, Autumn Rhythm, viewed from the perspective of Christian belief, serves as an interesting allegorical representation of the life to come, one in which we will have fully resurrected bodies. Whether in regard to the Incarnation, the Resurrection, the Eucharist or simply the notion of the human being as “body-soul,” Pollock’s action paintings bear uniquely Christian epistemic potential. Jackson Pollock, Autumn Rhythm (Number 30), 1950, oil on canvas, 267 x 526 cm. The Metropolitan Museum of Art, New York.